Green Shutters Beach House is a custom built home in the beautiful neighborhood of Seacrest Beach near Panama City Beach, Florida. The house was featured in the on-line magazine AL.com for its ‘welcoming accommodations and proximity to Rosemary Beach and the Village shops and restaurants.’ The walking/bike trail connecting the Seacrest Beach neighborhood to Rosemary, scenic 30A, and neighborhood amenities is right out the door. The home’s decor was refreshed and updated in 2018 and is ready for your vacation. 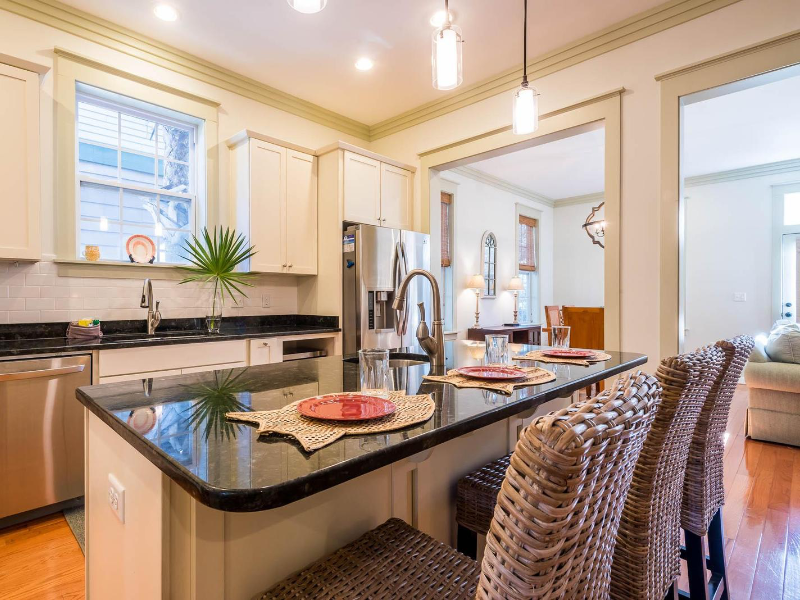 This home features a gourmet kitchen with granite countertops and stainless steel appliances. The kitchen also has an extra free standing ice maker, perfect for filling your beach cooler, as well as a wet bar. An open concept living and dining area is adjacent to the kitchen. The dining table has seating for 6 with additional seating for 3 at the kitchen island. The living room has a flat screen TV with expanded cable and a Blu-Ray player, making this home perfect for entertaining and relaxing. The first floor bedroom features a comfortable king bed, sliding “barn doors” and new furniture added in 2018. There is now a full bath with shower next to the bedroom – new in January 2019. The wrap around deck has plenty of space for relaxing and dining with a gas grill conveniently nearby as well as an outdoor shower. Perfect for washing off the sand after a fun filled day at the beach. The master suite is located on the second floor. This private sanctuary features a King Bed updated in 2018 with a new Eurotop mattress. There is also a flat screen TV and large walk in custom closet. An ensuite master bathroom provides a large spa shower with 3 shower heads, a soaking tub, double vanities and a separate water closet. Enjoy the tropical breezes on the adjoining private balcony with comfortable seating. Also on the second floor are 2 large guest rooms. The first is a Queen bedroom with flat screen TV and was recently decorated with new linens and window coverings. The second guest bedroom has 2 twin beds and flat screen TV. A shared bathroom is located in the hallway featuring a tub/shower combination, dual sinks, granite vanity and separate water closet. A separate laundry room with new washer/dryer (added in 2018) is conveniently located in the hallway. This home is in a great location right on the walking/bike path and directly at the Seacrest Beach Tram stop. The seasonal tram will pick you and your beach gear up from the tram stop and take you for a quick trip to the beach or pool. The beautiful 12,000 sq ft Lagoon Pool is but a quick walk or tram ride from Green Shutters Beach House. Take in the refreshing ocean breeze during a leisurely stroll to the Villages of South Walton. With several dining and boutique shopping options, you will have plenty to do after a long day at the beach. Find us on Facebook at Green Shutters Beach House.